Between weather, sickness and work I haven't been able to get into the patch and clean it out. Finally got to that this week and tilled the patch this evening. I tilled in alfalfa pellets, fallen leaves with grass clippings, gypsum, humic acid, peat moss, calcium, iron, manganese, chunks of pumpkin along the cover crop I planted on the southern end of the patch back in August. 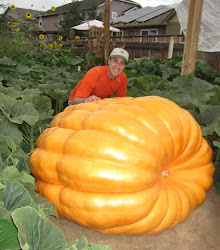 The best thing you can do for your pumpkin next year is to prepare the patch now in the fall. In Colorado the winter temperatures are typically warm enough that what I have tilled into the patch will be mostly broken down come spring time. I didn't get a cover crop in early enough so I'll put in a cover crop as soon as I can in the spring to get it going. Night time temperatures are probably too cool now to see the patch and get much of anything going. The clone plants are all rooted and alive. One is starting to take off. Got a green house for one of the plants, but if anyone knows of another green house that I can send another one of the plants to please let me know.